MySpace began, in part, with the notion of building a bridge between music fans. Two years ago, the News Corp company made plans for the logical extension: a full service digital music store. Now, a lawsuit and a long wait later, the 30million plus music listening members (that’s 30m that listen to music on the site) out of their 110 million subscribers will get just that. 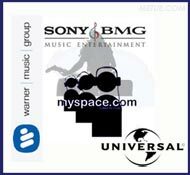 Sony BMG, Universal Music and Warner Music Group, three of the world’s “Big 4” music labels are partnered in the effort. Each along with MySpace (News Corp) will have an equity stake in the project. Management will be from a board made up of representatives from all four (MySpace and the three labels). EMI, the fourth label, and the trailblazer that cut the path toward DRM-Free music isn’t participating. They are reportedly still negotiating, however, and it’s expected a deal will be reached to bring them on board in the coming months. The cornerstone of the new MySpace Music site is flexibility. The site will function as a broad portal where music fans can interact across their own personal pages and artist pages, explore and discover new sounds (and videos), or buy downloadable music outright. The site is also to feature a mobile component expected to be built around News Corps’ Jamba (aka Jamster) (News Corp bought 51% of Jamba in September 2006). Some of the specific functionality remains unspecified buy visitors will be able to listen to streams of ad supported (e.g. free) music, share playlists, watch videos or buy tracks. There is also a plan for them to be able to buy tie-in merchandise ranging from fan-wear (t-shirts and souvenirs) to concert tickets (note: no ticketing partnerships have been mentioned yet though Live Nation,Ticketmaster or others could foreseeable be interested participants). All of the assorted features and functionality will roll out initially in the U.S. Much of them will deploy within three to four months. A global launch is anticipated later but not forecast pending the resolution of licensing issues. Achieving those goals is far off. The obvious challenge along the way will be whether or not the new venture can take web traffic and convert it to sell-thru. By taking the ecommerce component to where the customers are already congregating, rather than asking music fans to come to them, there is clearly vast potential. On the other hand, there’s also going to be heavy competition. Just today, Ars Technica ran a story saying advance data from the as yet unreleased from the NPD Music WatchSurvey shows Apple jumped past Wal-Mart to become the largest music retailer (online or off) in the U.S. for the month of January. The article claims Apple held 19% of the market. Their closest digital competitor, Amazon, finished fourth with 6%. (In between: Wal-Mart@ 15% and Best Buy @ 13 %). If the data in the article proves accurate, and there’s no reason to doubt it, it’s all the more amazing considering Apple grew to that stature (up from number 3 last spring) despite still only being licensed to sell music from just one of the Big 4 labels (EMI) without DRM encryption. Amazon, in contrast, has all four without copyright restrictions. For MySpace music to become a retail contender, they’ll have to beat Apple and Amazon at their own games. There also going to face competition from other stores like emusic and from more direct rivals like music social net iMeem which, though similarly unrealized, has the potential to be much more too. Potential is really what it’s all about. MySpace Music has a lot of it but for now, it’s just promises unrealized. It is vast potential …and a story grabbing a lot of headlines because of it. MySpace Music will be based out of Los Angeles.